Moments pass so quickly. We’re young and then we’re not. We surrender too much time to worry and what if, frivolously letting joy-filled moments pass by without notice. Looking through a box of old photos, I found some photos that capture simple family moments. There’s a special beauty and clarity in black and white photos. 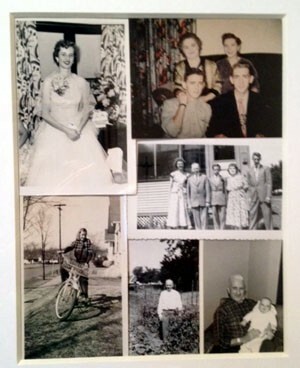 A collage – a story of family, youth, fun, love. Family history that has lead to this very day. A reminder that while we age, we need not be old. Each day, we can choose to be grateful, to love more and to linger in the simplicity and depth of each moment. Old photos have such a depth of feeling. Utterly sweet-tasting, and yet…they leave just a bit of a hole. I was trying to process this hole as I watched a YouTube clip of Mama Cass yesterday. It took me straight back to youth…sweetness…..and then left a dent…reminding me that there are layers upon layers of new moments to sort through at the same time. Beautifully said and very true. Thank you.